Good summary of information about the film, including photos and clips. "Dialogue on Film: Dustan Hoffman"
by Mich Tuchman. Conducted following "Tootsie", Hoffman discusses his acting style. "Dustin Hoffman: Acting His Age"
by Mark Roland. A 1988 interview where Hoffman reflects on his career. Biography of Schlessinger with complete film, theater, and opera credits. "John Schlessinger Speaks No Evil"
From a 1979 interview, Schlessinger discusses his themes and his directing style. This is an official FGCU web page. Designed by Terry Dugas and revised 4/18/99. 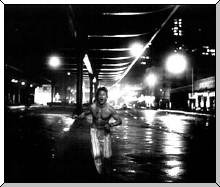 Uncredited photo from the American Film Institute site.